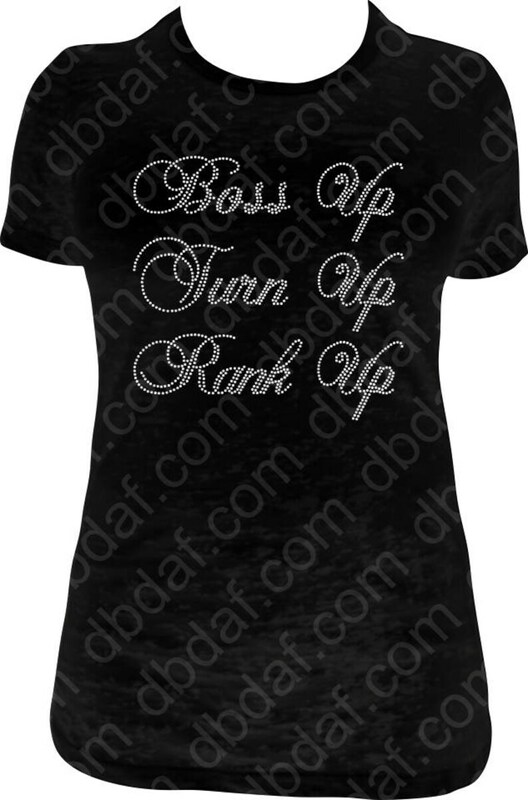 Boss Up bling design! This design is approximately 11.8"L x 12"W.
All shirts are made to order and not mass produced. DBDAF Bling Designs recommends that garments be turned inside out before washing (hand or machine), using cold water (no bleach) and Hang Dry. Please do not dry clean. Wore this shirt on the perfect day! True to size . Looked amazing !! Letters on arms peeling off upon arrival. Junior XL does not match store XL. Contacted Seller-They don't care. NO REFUNDS, DON'T CARE. I'm stuck with useless expensive item. Beautiful! This was a perfect gift! I strive for perfection, but if I make an error on your order I am happy to correct it! All shirts are custom made to order specifically for each customer and not mass produced. Due to my wide selection of crystal and shirt colors and styles, each of my crystal rhinestone products is specially made-to-order per your specifications. Please check the sizing info carefully as all sales are final on made to order and custom shirts. If you have any questions about sizing or fiber content, please contact me before placing your order. Shipping is through USPS and can take from 2 to 4 days depending on location within the US. Items shipping to areas outside the US usually take between 10 and 18 business days to arrive. For overseas buyers: Import duties, taxes and charges are NOT INCLUDED in the item price or shipping charges. These charges are the buyer's responsibility. Please check with your country's customs office to determine what these additional costs will be prior to bidding/buying. Any non-custom returned item not collected from Customs (refusal to pay the charges) a refund will be issued minus shipping once it is returned. There are no refunds on custom ordered or personalized items. Thank you for choosing DBDAF Bling Designs for all of your fashion needs. We appreciate your business and look forward to "Enhancing Your Dress" on your next order. Please Leave ***5 STAR*** Positive Feedback. We believe 100% in customer service and strive for 5 STAR service! If you have any issues with your order, please contact us first to resolve the issue! All shirts are made to order and not mass produced. Please check sizes before order. We do not exchange or refund for the wrong size ordered. Thank you in advance. Perfect on its own or ready-to-layer, this tank gathers in the back for an updated look. DBDAF Bling Designs recommends that garments be turned inside out before washing (hand or machine), using cold water (no bleach) and low heat in the dryer. Please do not dry clean. A tee made to go with nearly everything in your closet? Perfect. Nothing is better for relaxing than our 9-ounce favorite at a budget-friendly price. Nothing is better for relaxing than our Cozy sweats in our core weight. A V-neck with up-to-date style. You're ready to jam in a tee that's as cool as the night's summer breeze. Be your own fan in this soft essential. Move to your own beat in this fully amped long sleeve tee. In this tee, you’re ready to rock and roll.